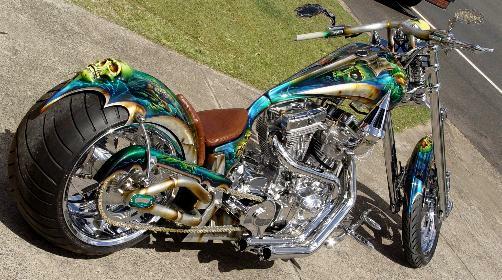 "Page 1, More Airbrushed Motorcycles"
Click Here "2018 Airbrushed Motorcycles"
Candy apple green over airbrushed artwork on 1978 shovel. 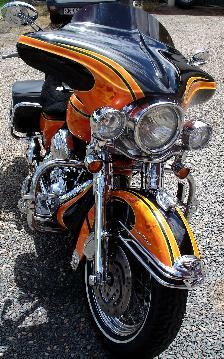 Grim reaper theme on Harley Davidson in candy apple red and yellow. 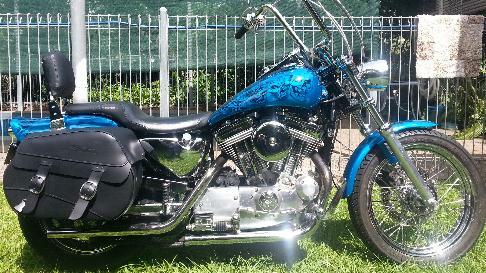 Harley Davidson from Darwin, airbrushed skulls in candy apple regal blue. 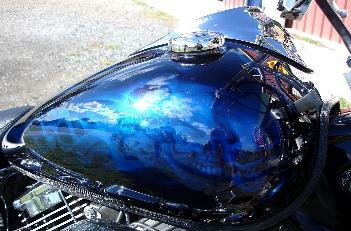 Airbrushed skulls in black and blue celtic flames over white base on Harley Davidson with matching helmet. 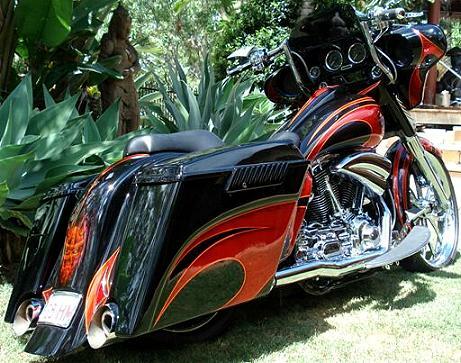 This chopper is a credit to the owner's 3 year's of hard work, He sculptured and tig welded all the 3D. steel flames and air intakes onto the tank and guards. 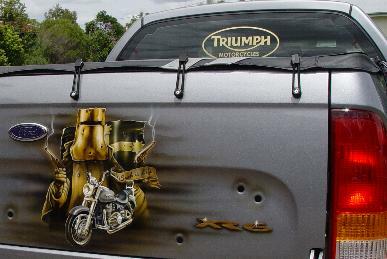 Airbrushed mural of croc and a Aussie wedgetail eagle on Harley tank. 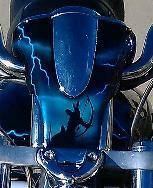 Airbrushed "Bundy Bear" in blue grafix on custom build motorcycle. 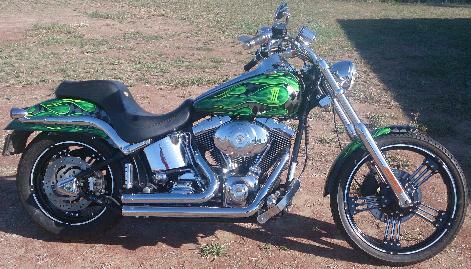 Harley Davidson with airbrushed green realistic flames with black checkered overlay and also matching helmet. 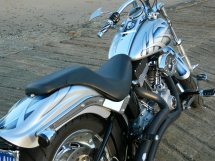 2013 Harley Davidson with airbrushed artwork painted in white, silver and black only. 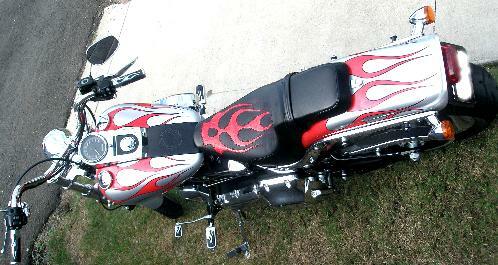 Harley Davidson with tank extentions and airbrushed scalp hunter in candy red. 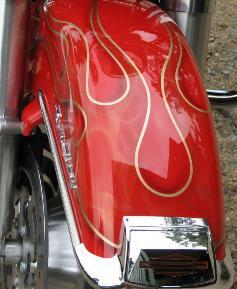 Airbrushed steel flames over original Harley paint. Lots of details, in this Indian themed airbrushed artwork on Harley Davidson tins. 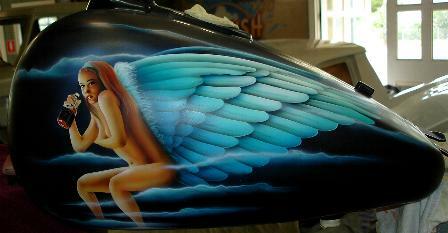 Airbrushed Angel on 2010 Yamaha Star. Harley tank art, to be used as a wishing well for a wedding. 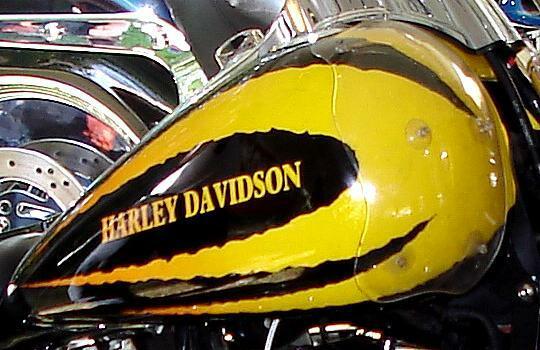 Harley Willy "G" logo's with Candy realistic flames over black base on Heritage Soft Tail. 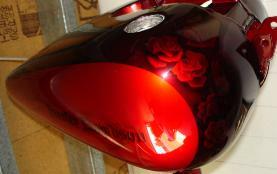 Airbrushed artwork in silver and black "BEFORE" the Candy Apple Red overlay. "AFTER" the Candy Red overlay. 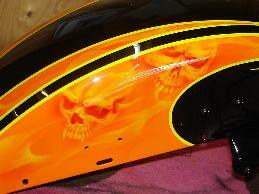 Clown murals over Canary Yellow base with Gold pearl and Orange candy flames overlay. 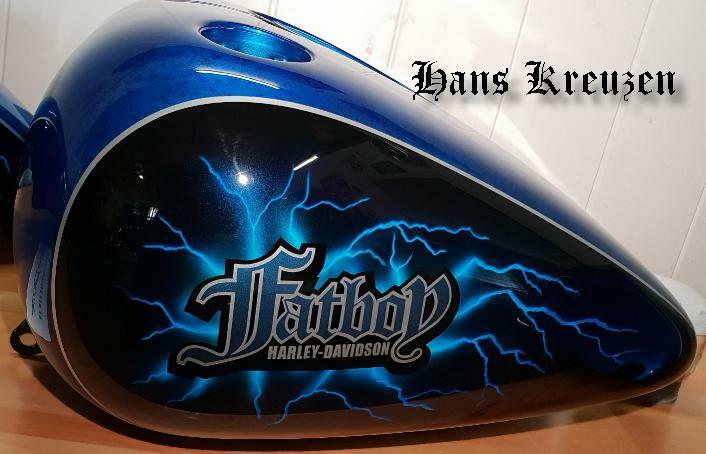 These tin's were painted and airbrushed, using only Black and White. Procharger with 10psi of boost (149hp and 138 torque) and twin disc brakes. 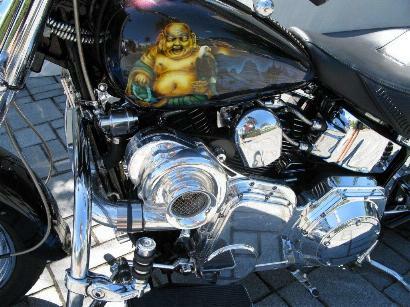 Airbrushed Buddha and "live to ride" written chinese on Harley Davidson. 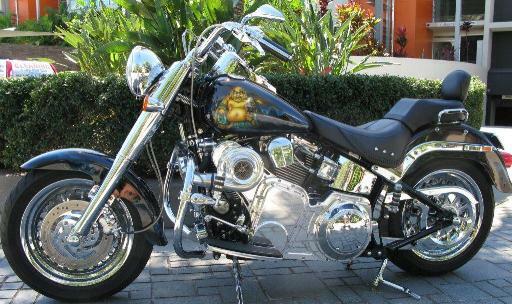 Bike is from Airlie Beach Qld. Scallops in yellow pearl over black base. 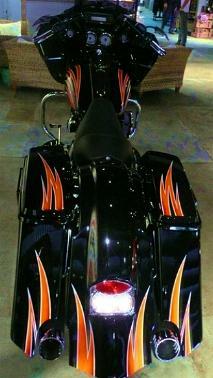 Inspired by the movie " Harley Davidson and the Malborough man"
Candy apple purple and blue skuls over black base. Cream inserts over black base with candy green pin striping and flames. Wizard murals and marble in candy apple Royal & Regal blue over black base. Extra sparkle silver metalic with marble candy Royal blue 3D. grafix. 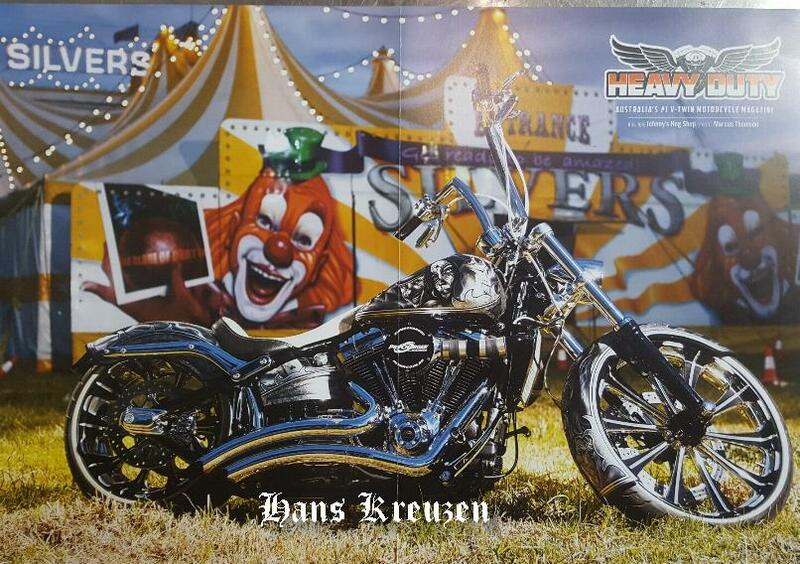 Crow's and skull theme on Harley Davidson. 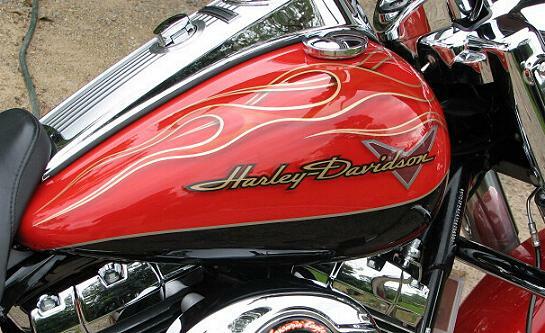 Candy apple red inserts and artwork on Old School Harley from Victoria. 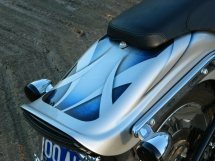 Kelly theme on Harley Trike rear trunk lid and front guard. 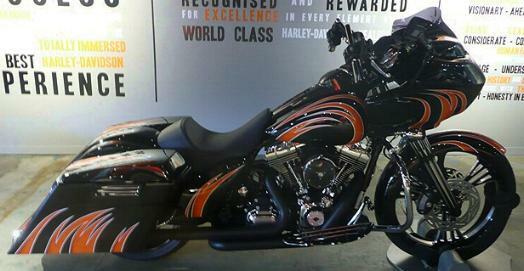 Electric Orange Mica base with Candy Apple Orange grafix's on Harley Deuce. 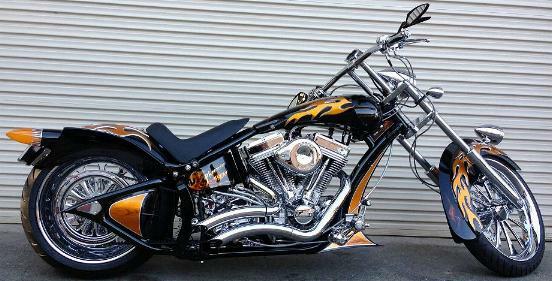 The completed project bagger build by Rockhamton Harley Davidson. The grafix are Orange with Gold pearl realistic flames over-lay. 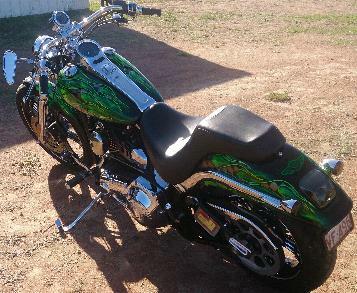 Airbrushed dragon murals on Harley Davidson. Awsome photo's by www.powershots.com.au, click here for link. 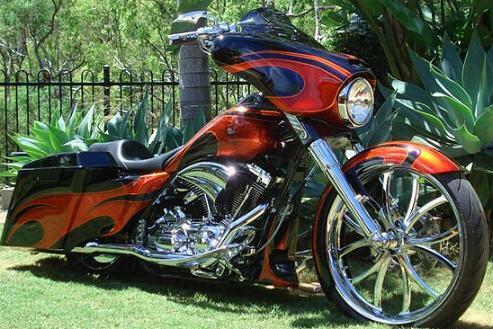 Candy Apple Burned Orange grafix over black base on Bagger Harley. 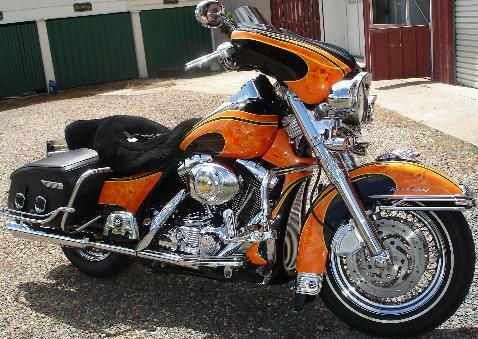 The Orange has Viking skull murals and realistic flames in the silver base..
Old colour sceme on Thunderbird tank. 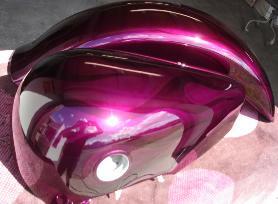 Brand New 2013 Triumph respray's in custom colours. 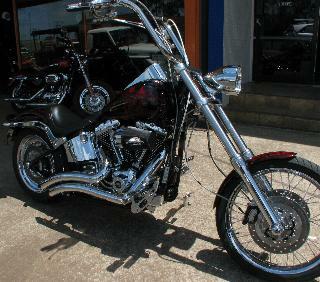 Click here for a link to Sunstate Motorcycles Website. Using Candy Apple Gold and black over the original factory silver. Gloss black flames over flat black finish. Candy apple orange and silver grafix with green realistic flames. 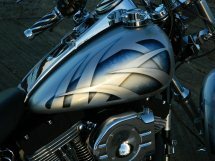 Airbrushed artwork on Harley Davidson. 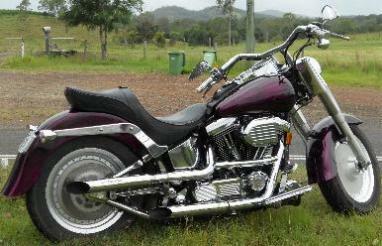 Bike is from Moranbah Qld. 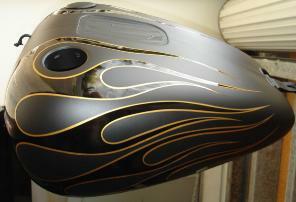 Candy apple orange and black with airbrushed steel finish grafix. 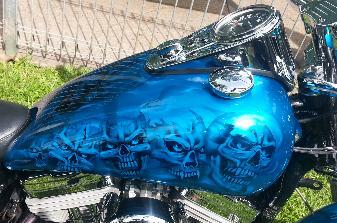 Blue realistic flames with white highlights and skulls. Candy apple violet and blue over silver and white airbrushed artwork. 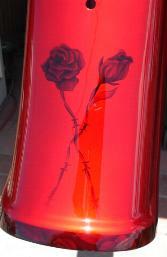 Candy Apple Red murals on Harley Davidson. Leo star sign designs in Royal blue candy apple and black. Candy pearl Sable over black base with cream scollop inserts. Ghost flames in purple candy apple. I just had to show you this scooter I airbrushed for Piranha's drag racing pit crew. 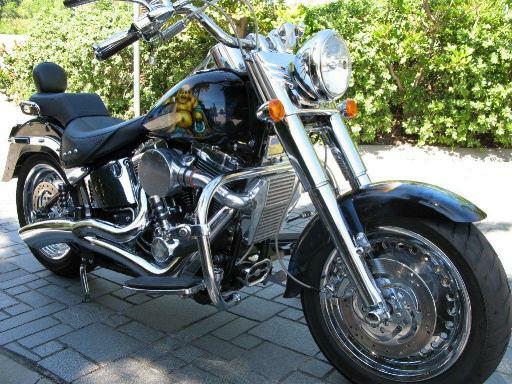 Airbrushed "Bat out of hell, meatloaf" murals on Harley Davidson. 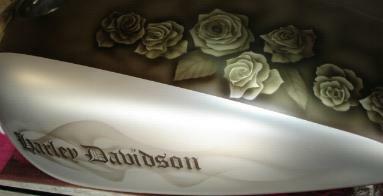 Airbrushed artwork in silver and black with candy apple red overlay on Harley Davidson. 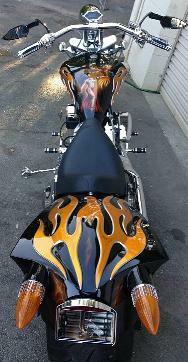 Airbrushed flames over original paint, On brand new Road King. Ghost flames in Sable candy pearl over black and silver base. 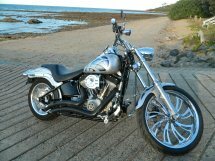 Bike is from Noosa Qld. Black Zircon pearl base, Overlaid with Orange grafix with airbrushed skuls and gold pearl realistic flames. 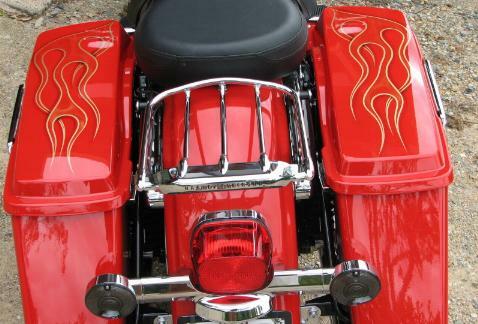 Pinstriping and red realistic flames around badges and logo's. 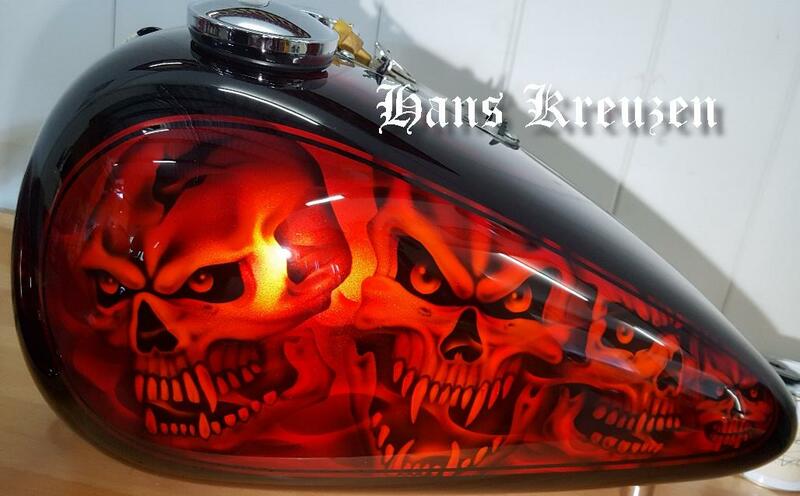 Realistic red flames and skulls over black base. Royal blue candy apple and black two tone.